Lovely words to this children's action nursery rhyme which is often referred to as blackbirds baked in a pie probably because the image that blackbirds baked in a pie would create in a child's mind. The rye (a pocketful of rye) was purchased to feed birds. Blackbirds, and other song birds, were actually eaten as a delicacy! 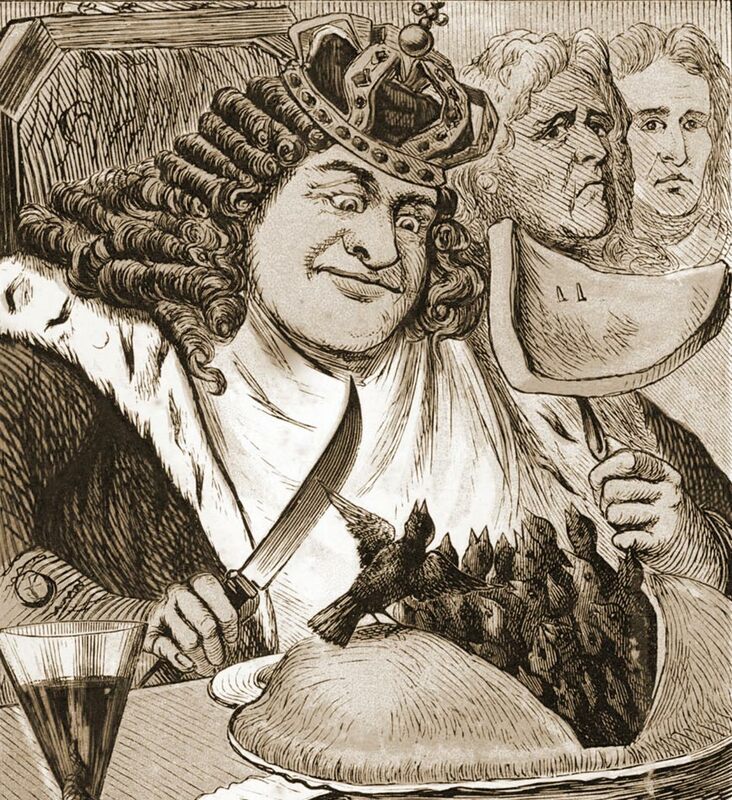 However a court jester may well have suggested to the court cook to bake a pie pastry crust and place this over some live blackbirds to surprise and amuse the King! It would not be unreasonable for the blackbirds to look for revenge hence "When down came a blackbird and pecked off her nose!" It is interesting to note that the references to the counting house and eating honey were the common man's perception of what a King and Queen spent their time doing. The nursery rhyme Sing a song of sixpence or blackbirds baked in a pie always end with the tweaking of a child's nose! The connection between this Rhyme was made by James Leasor in 1961 in his non-fiction book' The Plague and the Fire. Some people are sceptical of the plague interpretations of this rhyme, many stating that words in the rhyme cannot be found in Middle English. The sceptics must be referring to the later version of the rhyme, possibly with American origins, the English version is "Ring a ring o' rosies" using the Middle English "o" as a shortening of the word "of". The written word " posies" is first mentioned in a poem called 'Prothalamion or A Spousal Verse' by Edmund Spenser (1552-1599. We believe that this addresses the views of the sceptics. Our grateful thanks goes to Rebecca Harris and David Bardwell for providing the following additional information about Sing a Song of Sixpence: Rebecca wrote, "During the Medieval times, there were occasions when the cook in the house of a wealthy knight did indeed put live birds (often pigeons, but I'm sure it could just as easily have been blackbirds) inside a huge pastry crust, on his own initiative. This was seen as a great joke and the cook would usually have a real pie waiting to bring in when the birds had been released." Flew down from the tree tops and popped it on again"